Unfortunately, different versions of Java have different requirements. Instead of forcing everyone to use the latest version we decided to create several launch options to facilitate older version. Java Applets are the legacy method of launching Java applications from a web site. 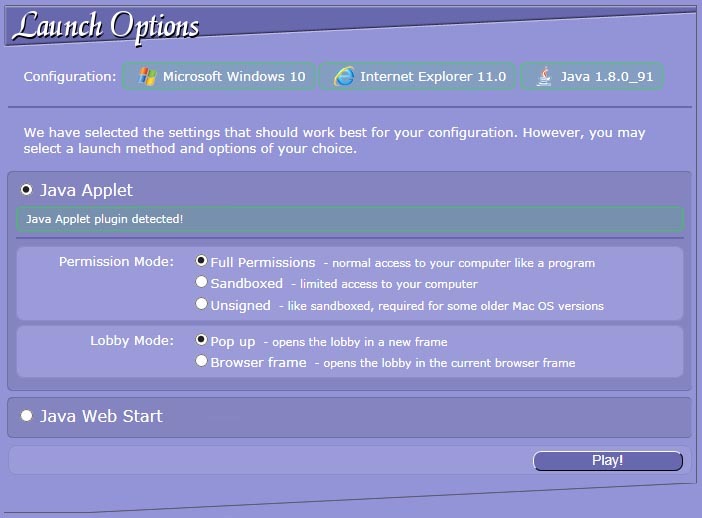 To run Java Applets you need to have the Java Browser Plugin installed and enabled for your specific browser (this may not be included in your default Java installation). Java Applets have been around since Java 1.0 but have drawn a lot of negative attention due to security issues over the past years. This is why Java Applets will no longer be supported in new releases of operating systems and browsers. This option is required for Java 8 and up. Although our games only use the permission to connect to our lobby, it needs to be granted full permissions (we use the the term 'full-permissions' but the actual Java term is 'all-permissions'). When running with full permissions, the Java application acts like any other program on your computer. When trying to run our games using Java 8 in sandboxed mode you will get an error message like: java.security.AccessControlException: java.net.SocketPermissions. This option is recommended for Java 7. You will be able to run our games in 'full-permissions' mode without problems but it is my believe this is undesirable. When sandboxed, a Java application can not access your personal files (when running in full permission mode, a Java application acts like any other program on your computer). This option is sometimes needed for Java 6 and older. The option was primarily added for older MacOS versions that don't have an option to install a newer version than Java 6. You will need this option if you get the message 'JAR manifest requested to run in sandbox only'. The option is named 'unsigned' but our games will actually run (unsigned) in sandboxed mode. This option opens the lobby in a new browser frame/window. You may need to allow pop ups for our website to use this option. This option opens the lobby in the current browser frame/window. If you do not wish to allow pop ups for our website, use this option. Java Web Start is the future method of launching Java applications from a web site. A Java program starting with Web Start will act like any other program on your computer. You don't need a browser plugin for Java Web Start thought different browsers handle Web Start differently. Java Web Start is launched using a .jnlp file. Some browsers (like Internet Explorer, Edge) open this file directly and you will notice little difference with the Applet method. Some browsers (like Firefox and Chrome) download the .jnlp file to your downloads folder and open it from there, your downloads folder may become cluttered with our .jnlp files. Other browsers (like Safari) may only download the .jnlp file and may or may not ask you to open the file. In any case, you can open the downloaded .jnlp file to start the lobby. If it asks how to open it you may choose 'Java Web Start' or if needed, locate the javaws(.exe) program on your system to open it. You can save the .jnlp for future use, e.g. save (a shortcut to) the .jnlp on your desktop, but you may not receive any updates if you do so! Java Web Start can only run in full permission mode. Java Web Start will always open a new frame/window.